Porcelain is a part of the engineered stone family. Porcelain is made up of 100% natural, raw and clay-based materials. Impurities such as silica, mineral oxides, and feldspars do exist in the clay. But rather than detract from porcelain’s quality, these impurities only add to porcelain’s strength and color. Porcelain has no problem at all with handling hot pots and pans directly on its surface. Porcelain’s toughstructure also makes it scratch-resistant. Besides being very low-maintenance in keeping clean, it’s also non-porous and stain-resistant. 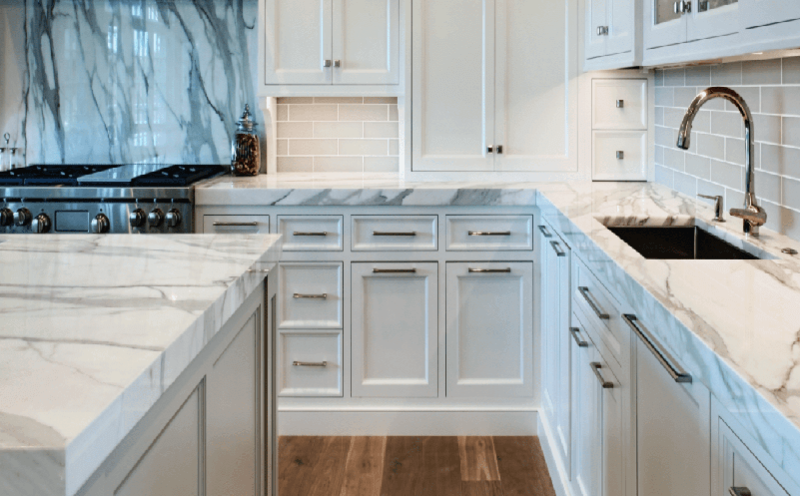 WHY SHOULD I CHOOSE PORCELAIN FOR MY COUNTERS? What’s neat about porcelain countertops is their light weight allows them to be installed in one slab right on top of your existing counter. That’s a huge cost-saving factor there because you don’t have to demolish the old counter at all.